Treasury Secretary Steven Mnuchin testifies before a House Appropriations subcommittee during a hearing on President Trump's budget request for Fiscal Year 2020, on April 9, 2019, on Capitol Hill in Washington. President Donald Trump’s personal lawyer on Monday urged the Treasury Department not to hand over Trump’s tax returns to House Democrats, warning that releasing the documents to lawmakers he accused of having a “radical view of unchecked congressional power” would turn the IRS into a political weapon. It was the second such letter written on behalf of Trump since Rep. Richard E. Neal, the Democratic chairman of the House Ways and Means Committee, formally requested six years of the president’s personal and business tax returns earlier this month. 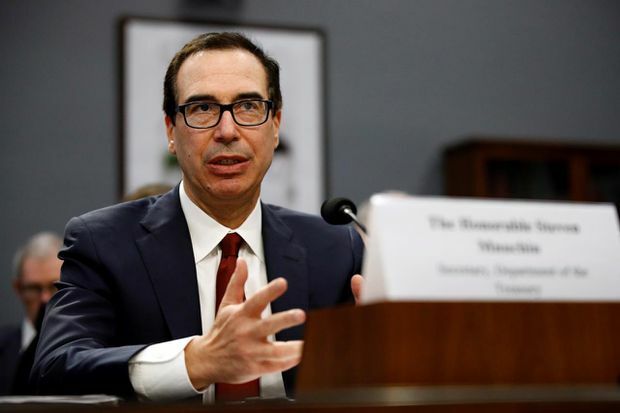 Neal on Saturday gave the IRS until April 23 to provide him with the tax returns after Steven Mnuchin, the Treasury secretary, said last week that he could not meet an earlier deadline because he needed to study the lawfulness of the request. The fight over Trump’s tax returns is expected to turn into a protracted legal battle that will likely make its way to the Supreme Court. Trump, who declined to provide his tax returns while running for president, continues to cite an ongoing audit as the reason he cannot release the documents, despite no rule or law that prevents him from doing so. Neal used an obscure provision of the tax code to request the returns, which he said his committee needs in order to evaluate the policy of automatic audits of presidential tax returns. Trump and his defenders argue that the request is being driven by politics and represents presidential harassment. Neal argued in his letter Saturday that the administration has no authority to question how the committee would handle the information or the validity of its legislative purpose. Trump’s lawyer, William S. Consovoy, said Monday that the legal rationale behind Neal’s dismissal of the Treasury Department’s concerns was wrong. The little known tax code provision employed by the Democrats in demanding Trump’s returns says that the IRS “shall furnish” the information. But Consovoy, echoing an argument that Trump administration officials have made privately, said that in this case the intent of the law is more important than the letter of the law. “Congress’s motives do matter under the Constitution,” Consovoy wrote, arguing that the request for Trump’s tax information does not serve any legislative purpose. The president’s lawyer, whose views have no direct bearing on the case, went on to cite Republican senators who have said Neal’s request was not made in good faith. He noted that House Republicans on the Ways and Means Committee concluded that a request for Trump’s tax returns was not a legitimate use of their oversight powers. “Chairman Neal’s request is nothing more than an attempt to exercise constitutional authority that Congress does not possess,” Consovoy wrote. Mnuchin, who as Treasury secretary oversees the IRS, is personally supervising the response to the request. While he has said that he will follow the law, he made clear to lawmakers last week that he believes releasing Trump’s tax returns would be a violation of privacy and would politicize the tax collection agency. Treasury Department lawyers conferred with White House lawyers before the request and Mnuchin said that his staff is consulting with the Department of Justice. He did not say if he would comply with Neal’s latest deadline.